Now, I do have a confession to make.....this is the FIRST time I have used my Create A Critter cartridge and I have had it for 9 months ::GASP:: I know. I know. That doesn't happen very much with my cartridges, but I absolutely loved the images on this cart when it first came out and I *thought* I would use it all the time for projects with my kids, but this is the first time it has seen use in my Cricut machine. Well, now that I can see how cute the images are cut out and how easy they were to layer together, you bet I will be using it more often. On the SRM Stickers blog, you can go and leave comments on the Cosmo Cricket projects this week for a chance to win some awesome SRM Stickers, so hop on over and check them all out. 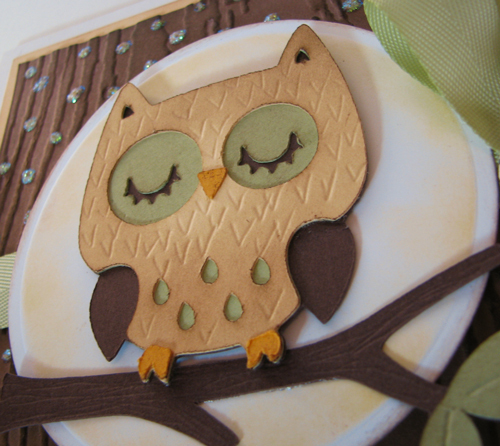 How cute s that owl card, LOve all the texture! 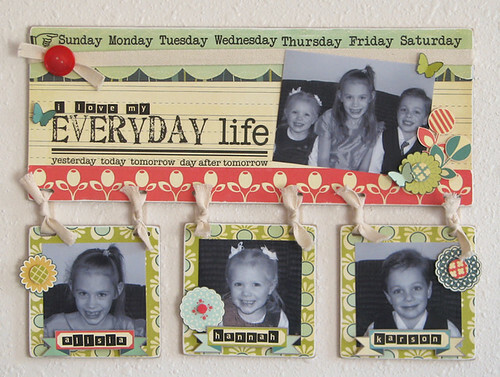 And the wall Hang with your kids is supper cute! Great job! ...by the way..I think I have about 5 cartridges I still haven't used yet! So don't feel bad! Lol..
Great detailing on that darling owl card! Your wall hanging is so sweet! Awww, both of your projects are fabulous, but I absolutely love your wall hang.. I may need to make myself one..
oh my goodness, where do I start...your darling card, CAC not being used, or that adorable wall hanging! 9 months and never used it?! that's ok, I probably have one that I had to have that I've never used! Aw... the owl card is so CUUUTE! 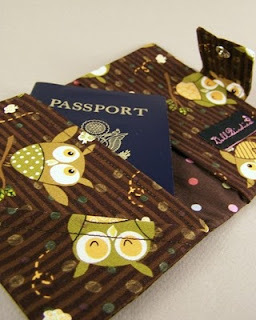 I love the embossed details on the owl and the colors are so sweet! Thanks SO much for playing with us at Etsy Inspired Challenge this week, Amy!! Love your inspiring work! Cute card!! Love the embossing you did on the owl!!! TOTALLY AMAZiNG card based on your inspiration piece!! LOVE LOVE LOVE the owl against the textured background! What a terrific card!!! Thanks for playing EIC with us this week! Woohoo, Amy!! Congrats on the shoutout at Moxie Fab!! Way to go!! What fun, great bling on this card. 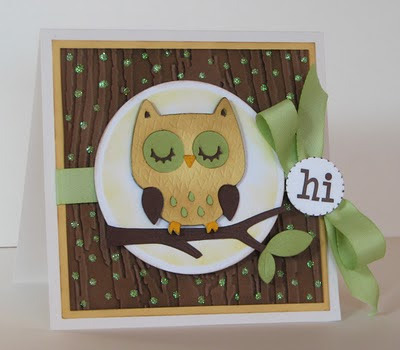 Cute Owl card and I love the wall hanging using Social Club. Fab job, I love all the texture! Well done for your shout out over at Moxie too! Thanks for playing along with us at EIC this week! I'm not very fond of owls, but seeing this? I think I'm changing my mind. :D This is just sooo adorable! Very sweet ....love the glitter dots. I would love to use this card as inspiration for a birthday card I need to make, as I have the CAC cartridge. I need to know though which embossing folder did you use on the owl's body as it's perfect for an owl or any bird really? Am I right to assume that you used the woodgrain folder for the background of the card?